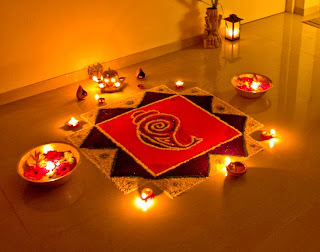 Diwali is known as the ‘Festival of Lights’. It originated from India through two religions: Sikhism and Hinduism. Although, both religions celebrate Diwali on the same day, they celebrate it for different historical events that took place in their religions. This year Diwali is on 3rd November 2013! For Sikhs, Diwali is particularly important because it celebrates the release from prison of the sixth guru, Guru Hargobind Ji, and 52 other princes with him, in 1619. The Sikh tradition holds that the Emperor Jahangir had imprisoned Guru Hargobind Ji and 52 princes. The Emperor was asked to release Guru Hargobind Ji which he agreed to do. However, Guru Hargobind Ji asked that the princes be released also. The Emperor agreed, but said only those who could hold onto his cloak tail would be allowed to leave the prison. This was in order to limit the number of prisoners who could leave. However, Guru Hargobind Ji had a cloak made with 52 pieces of string and so each prince was able to hold onto one string and leave prison. Sikhs celebrated the return of Guru Hargobind Ji by lighting the Golden Temple (Amritsar, Punjab, India) with deeva’s. This tradition continues today. On the night of Diwali fireworks light the sky at the Golden Temple and all over the world. * The return of Rama after 14 years of Vanvas (banishment). To welcome his return, diyas (ghee lamps) were lit in rows of 20. *The killing of the evil demon Narakasura by Krishna. Celebrated as Naraka Chaturdashi, one day before Diwali. On Diwali people light rows of lights to commemorate heroic figures in Indian mythology who triumphed over the forces of evil. Deeva lamps are lit to help Lakshmi, the goddess of wealth, find her way into people's homes. Therefore, people start their new businesses on Diwali as they believe it is a time which brings wealth and luck.